Taking the first steps to redesign your company website is not easy. Before starting a website redesign project it is important to set goals and ask the right questions. Not sure where to start? Read our top five questions to ensure you're taking the right steps. 1) What is your website goal? Is the purpose of your website to sell products? Do you plan to use the website to provide customer support? Is your goal to create (or build) a community? Make a list of these kind of goals to help determine what kind of content is needed to achieve those goals. We also suggest to look at your current metrics against these goals. That will help prove your ROI after the new website is complete, and provide great insight for decisions in the upcoming project. 2) What is—and what isn't—working with your current website? Audit your current website, and take a close look at all the content. Decide what is out of date, what needs updating, and what should be removed. To better understand what content is not effective, carefully review analytics. The current statistics for popular pages, bounce, exits, duration and goals will prove valuable to understand your user. For unpopular pages, determine if they need to stay on your redesigned website. If so, consider how you might increase user interest on these pages. It's always a good idea to stay up to date on Web trends as well as what your peers are doing. Note what your competition is doing well, and consider how you might build off of any good ideas to best serve your audience and their needs. 4) What do your visitors want to see? Get feedback from your audience via surveys, social media, and/or through requests for suggestions in your email newsletter. This input can help you better understand additional ways that you might want to enhance your website. Part of the blueprint/planning process at TBH Creative is persona definition where we interview and develop "personas" for each of your target audiences. 5) How can SEO be improved for your site? Is it for users to find your website? Are search engines serving up your website when users use key terms related to your industry, company or service? Improving your SEO will help search engines present your site to more potential users looking for your type of business. 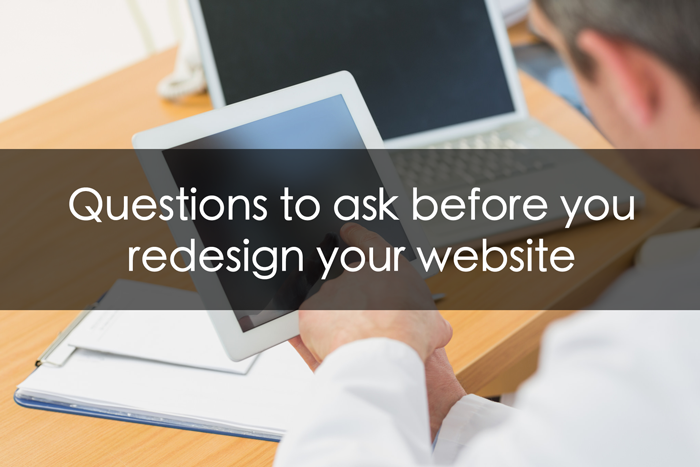 Still unsure if you should consider a redesign? Check out what TBH Creative says are five signs it's time to update your website. For a behind-the-scenes look at the redesign process, read this case study about our strategic website redesign for Imaging Office Systems. TBH Creative designs result-driven websites. Contact us today to help assist you in your website redesign.